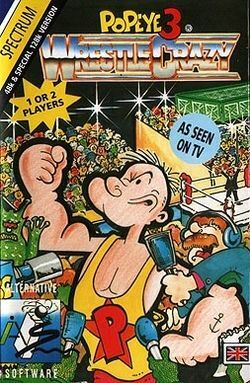 Popeye 3: Wrestle Crazy is a wrestling game, that had been developed by Bizarre Developments for Alternative Software and released upon the Sinclair ZX Spectrum, Amstrad CPC, Commodore 64 and Commodore Amiga in 1992; despite its name, it is the fourth title in the Popeye series (as the first one was the 1982 Nintendo arcade title), and was an attempt to cash in on the wrestling craze of the early 1990s. It was also the last Popeye-related video game that was manufactured in the United Kingdom. Our hero POPEYE has been kidnapped by the evil KRAGGS who wish to conquer the universe. To find out which planets are vulnerable, an intergalactic wrestling contest has been arranged. Popeye has been chosen to represent Earth, and must wrestle against 5 different vicious aliens to save our world from the KRAGGS! Grapple: To perform this move, you must make Popeye walk up to his opponent, then press O and P (or wiggle the joystick left and right) repeatedly, to grab him; the power meters at the top of the screen will show both Popeye and the alien's energy levels. If Popeye fills his meter before the alien, he will go into a headlock (which involves more rapid key-pushing, or joystick-wiggling, to fill his power meter again!) - and again, if Popeye fills his meter before the alien, you can press Space (or the joystick button) to make him perform a piledrive after which he can try for a pin. Kick: Push the key which corresponds with the direction Popeye is facing (or push the joystick in that direction), then press Space (or that joystick's button); however, pressing Q (or pushing the joystick up) causes him to jump instead, and if Popeye walks to either corner of the ring and does that, he will jump off the ropes. To pin an alien, walk over to him when he is lying flat in the ring, stand over him, and press Space (or the joystick button) - and the alien's energy must be low enough for Popeye to hold him down for three seconds, otherwise he will get back up again. Turbo Typhoon: When Popeye collects a can of spinach (thrown into the ring by Olive Oyl), his attacks will become more powerful, for a short period of time; he'll also automatically go into this move from a successful grapple after collecting a can. In a two-player game, the second player (controlling Torquos, Popeye's first opponent) may not perform the piledrive or turbo typhoon. In the single-player mode, Popeye must fight against five alien opponents: Torquos (who resembles the Alien Queen, from Aliens), Vantarga, The Plasmatic Shadow Man, Flug Durch, and Andrek 5 (who resembles Robot B-9, from Lost in Space); Olive Oyl and Mr. Wimpy are also in the audience, and try to help Popeye by throwing spinach and hamburgers into the ring for him to collect (however, the aliens will also realise the value of hamburgers and try to collect them as well). Brutus, however, shall throw bombs into the ring, which will explode when touched - but Popeye can use the bombs to his advantage by steering the aliens onto them. If Popeye gets pinned by any of the aliens the game will immediately end; however, once he has beaten Andrek 5, a picture of him holding a gold medal with a number 1 on it will appear on the screen, with his catchphrase "I'M STRONG TO THE FINISH...'COS I EATS ME SPINACH!" below it. In the two-player mode, the second player has to take control of Popeye's first opponent, Torquos (but he is unable to perform the piledrive, or turbo typhoon) - and once either player gets pinned, the game will end. This page was last edited on 21 October 2016, at 16:30.